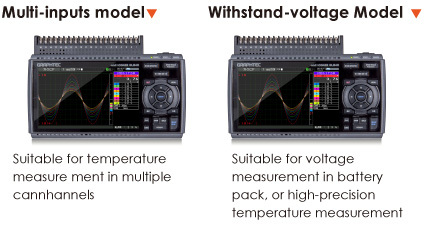 Along with the basic analog signal, Logic/Pulse, and digital sensors can be all connected to monitor a variety of measurements. 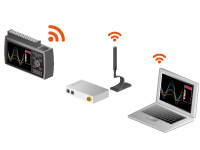 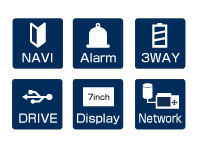 Wireless LAN option enables the wireless communication with other device.When the GL840 is set as a station, PC and smart devices will be able to access the WLAN unit directly. 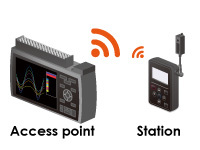 GL100-WL cab now be connected to the GL840 as a remote sensor using the WLAN feature.GL840 supports up to five units of the GL100-WL. 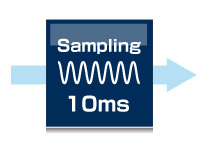 Provides faster sampling rate 10ms for voltage measurement. 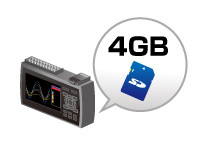 4GB SD memory card comes as a standard accessory installed in the first slot.The captured data can be stored in GBD(Graphtec binary data) or CSV file format.